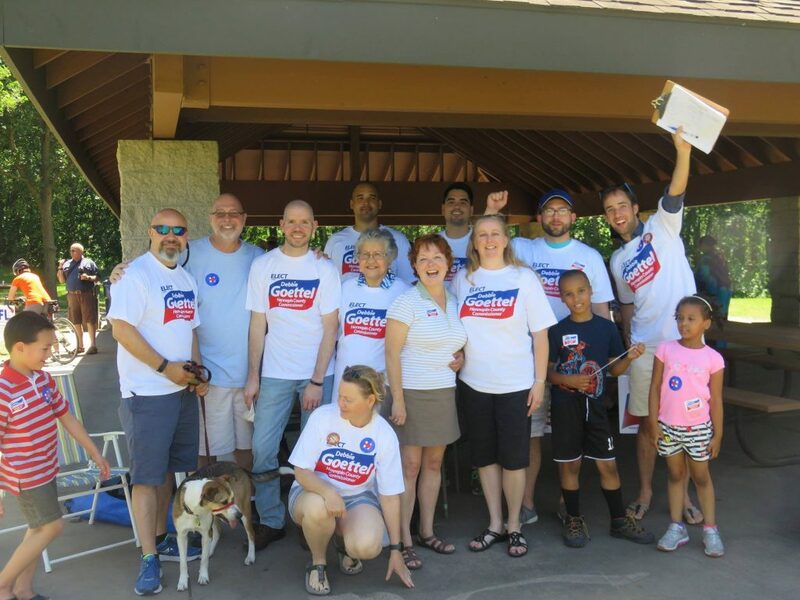 (Plymouth) – On a beautiful Sunday afternoon at Hennepin County's Clifford E. French Regional Park, Richfield Mayor Debbie Goettel asked for and earned the endorsement of the Hennepin County DFL in her bid to fill the Hennepin County Commission seat being vacated by retiring Commissioner Randy Johnson. The District 5 seat includes Bloomington, Richfield, and a large part of Eden Prairie. Six candidates including Goettel are running for the District 5 seat. Goettel was the only candidate to seek the DFL endorsement. Goettel said, "We all know elections are important because they're about the future...our future together as a community. The DFL endorsement is important to me because in a crowded field it tells voters who I stand with and who stands with me as we look to shape OUR future so Hennepin County remains a great place to raise a family and start a business." Goettel also discussed her support for LGBT equality as the Hennepin County Endorsing Picnic fell on the same day as the Twin Cities Pride Parade. "When some cities were disbanding their Human Rights Commissions so they could avoid putting forward partnership agreements, Richfield moved forward. We embraced the grassroots movement that led to the marriage amendment. We supported our DFL representatives and Richfield helped other cities that had the courage to move partnership agreements forward" said Goettel. Debbie Goettel was first elected Mayor of Richfield in 2005 and is serving her third four-year term. As mayor of Richfield, Debbie sought and won state and county funding for the 77th Street underpass that will transform that area, she led the "Do Town" initiative with the cities of Bloomington, Edina, and Richfield to improve public health, wellness, and the environment, and she worked tirelessly to redevelop Richfield’s new downtown. Debbie is a civil engineer with graduate studies at the University of Minnesota and Harvard University, and has extensive business management experience. She works in the environmental, health, safety and sustainability fields, and has worked for Medtronic, Nestle and Cummins NPower. In addition to the Hennepin County DFL Debbie has been endorsed by US Representative Keith Ellison, MN House Minority Leader Paul Thissen, State Senator D. Scott Dibble, Senator Patricia Torres Ray, State Senator Melissa H. Wiklund, State Representative Linda Slocum, State Representative Jean Wagenius, Eden Prairie City Council Member Ron Case, Bloomington Council Member Andrew Carlson, Richfield Council Members Pat Elliott, Edwina Garcia, Tom Fitzhenry, and Michael Howard, the DFL Disability Caucus, and many other business and community leaders.